Monet and his fellow Impressionists sought to depict life in a style that was unlike anything before. The style of Impressionism meant that color and the light that created it were at the forefront of the image. Human figures and epic tales took a back seat and the manner in which the sun or the moon bathed objects in different types of light were of key importance. Monet's style was key to this movement, as the artist sought to portray color and light in even more ingenious ways. His thirst to depict this element of art took him as far as the Mediterranean and various locations in central Europe. The result of such exploration was the birth and genesis of an artistic movement that is still greatly revered today. The early years of Monet's career were marked by several influential figures and mentors teaching him techniques that would later play a key part in the development of his own style. 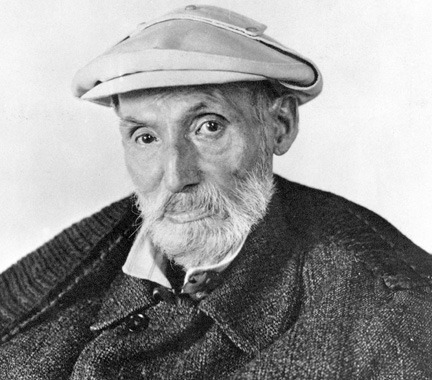 As a teenager, Monet perfected his burgeoning talent through charcoal caricatures and it wasn't until he met mentor Eugéne Boudin that he began to paint with oil. 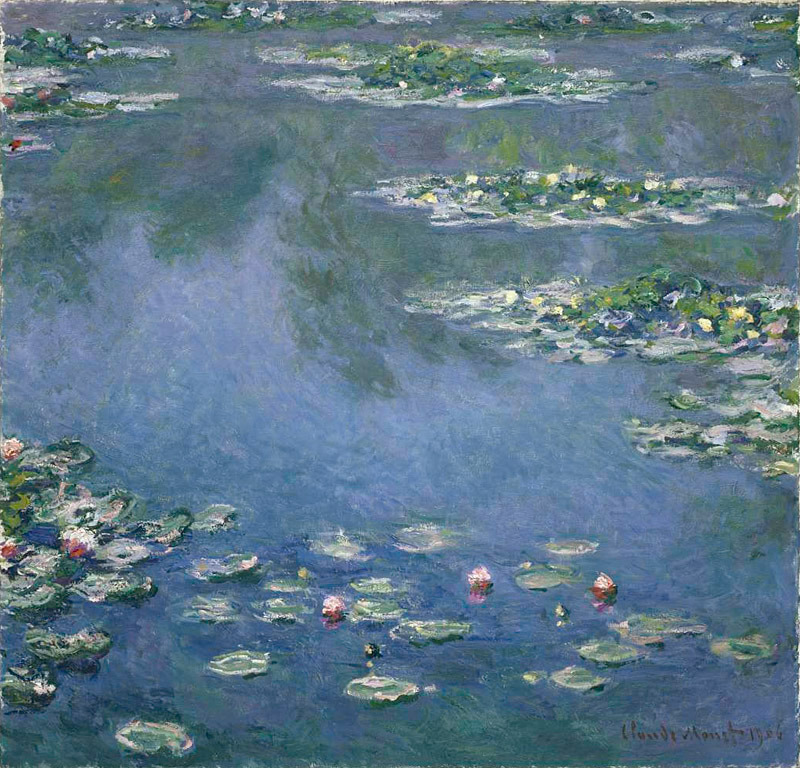 It is this notable technique that started Monet on his illustrious career. 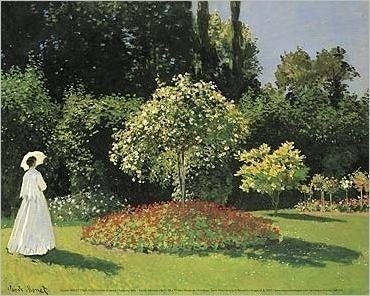 Monet's early style can be readily seen in his first recognized painting, Camile (also known as Woman in the Green Dress) and The Woman in the Garden. Despite not being a traditionally Impressionist painting, Monet's love of natural light can be seen in both of his earliest recognized works. The low lit dark tones of Green Dress and the natural summer sunlight of the Garden are a perfect display of Monet's early palette range. 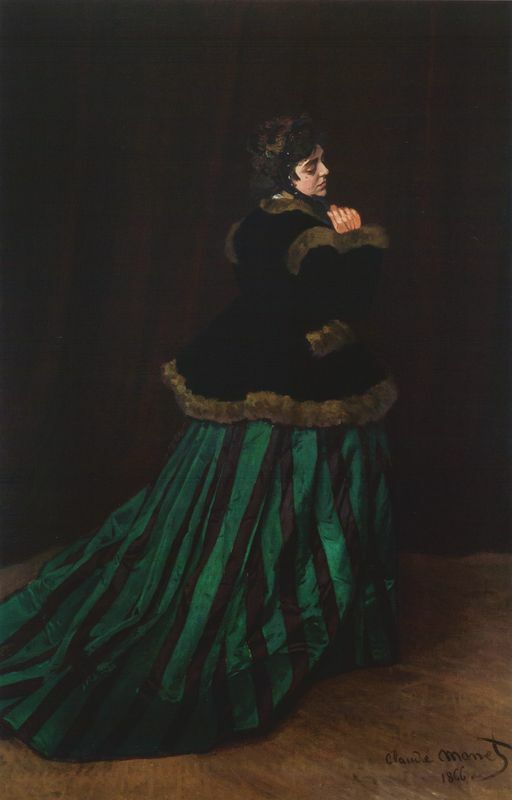 In Green Dress, Monet studies how light reacts upon touching various colors on his model. The dark blacks and browns of her fur coat seem as endless and as the darkened background behind her, whilst the low lighting seems to illuminate the lighter colors that she is clad in. The green of her dress is vibrantly portrayed and the minute amount of her skin on display radiates color against the low-lit room. Monet's interest in the study of color is on display again in the Garden. The beautifully lit day makes the white dress of his model and the freshly cut green grass see even more radiant. 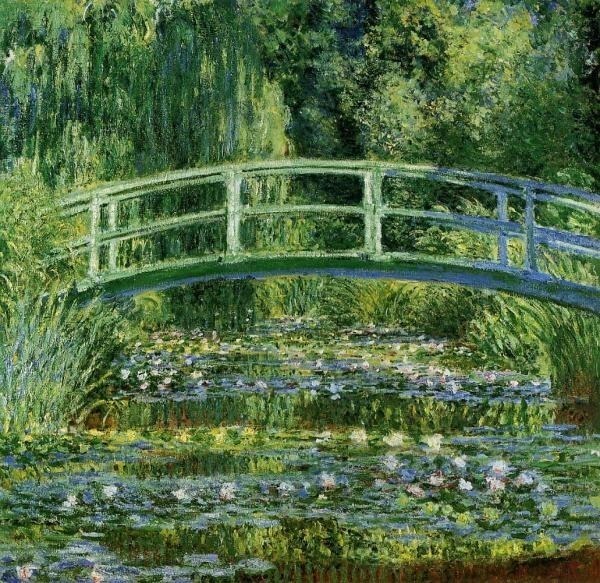 Monet's use of shadows and dark tonal shades of black further accentuate this. Both bear similarities in the manner in which the light is not obvious to the viewer, but is fully represented in how it affects the objects in both paintings. By the time Monet painted On the bank of the Seine, Bennecourt in 1868, which also featured his future wife Camille, his style was clearly changing. In addition to teaching Monet about oil paints Boudin also shared with him his style of "en plein air". This outdoor painting style would be adopted by the Impressionist circle, namely Alfred Sisley and Pierre Auguste Renoir. These painters would come to acknowledge their shared appreciation of a new style, which involved rapid brush strokes and broken color. 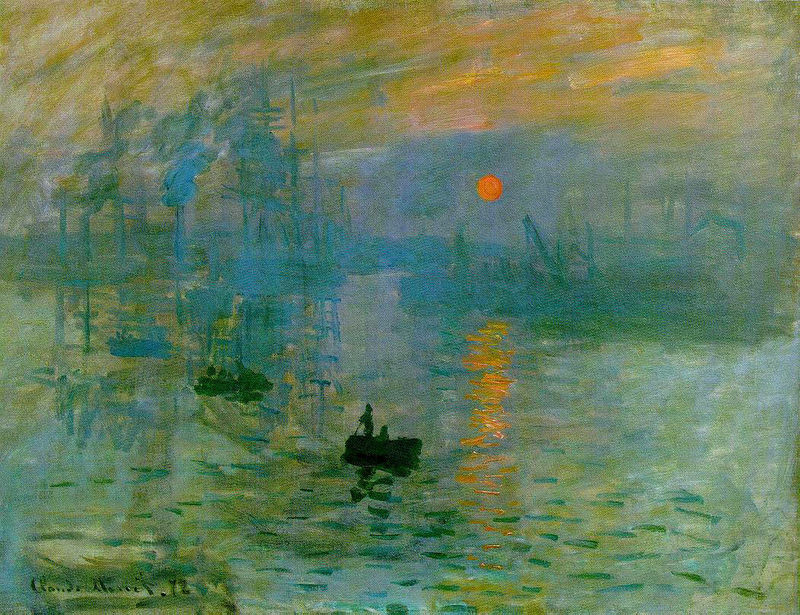 Perhaps the best example of this style was Monet's first greatly acknowledged Impressionist work, Sunrise, Impression. Monet's brush stroke is a key feature of his works. The technique, honed throughout his career relies on fast brush strokes in order to depict light in never before seen Realism. In Sunrise, Monet's Impressionist brushstroke can be seen in full effect. The piece itself is a painting of the port at Le Havre in France and Monet's rapid brush stroke is used to portray the setting suns reflective power on the gentle darkened sea. The only tangible solidly painted form in the work is the vibrantly orange sun and everything else gains or loses consistency depending on its distance from this ray of light. Monet's renowned use of color is directly linked to his use of light. The artist had a love of depicting color in new and experimental ways and this was heavily influenced by the different ways objects would look depending on the time of day. Such a pursuit, which included both night and day, meant that Monet's use of color was widely ranged. His use of dark tones was often utilized in order to further highlight his use of brighter colors. Monet's work drew such brutal criticism, because he was breaking the rules of artistic representation and this was particularly the case with regards to his use of color. His work was said to be influenced by the Japanese tradition of wood block prints. His colors were unmediated and such a preference gave further depth to his shadows. Unlike landscape artists of old Monet favored using light colors as a base for his painting instead of the traditional dark primers. Monet's personal Impressionist ability is said to have reached its peak with his Giverny-inspired series of paintings of Water Lilies and these paintings are what most people think of when considering Monet's illustrious career. After this high point came Monet's continued pursuit of actualizing the effects of the changing day on scenes. Monet's style notably changed towards his later life as he sought to pursue even more means of depicting natural lights effect on different scenes. One example of this was his series of paintings of Haystacks on his property in Giverny. The artist sought to painstakingly depict the changing look of something as ordinary as haystacks depending on the time of day they were seen. What followed was a series of noticeably different paintings from varied angles but of the same objects. Due to this his work, primarily in in terms of the palette used for a number of pieces, changed. Before the cataracts removal many of his works had a reddish hue that is said to be indicative of people suffering from the condition. 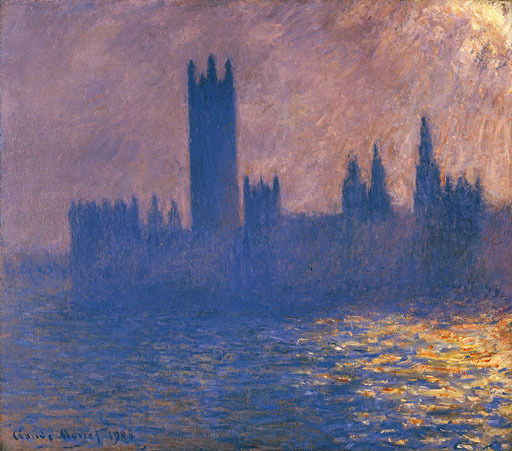 After the surgery to remove them many of Monet's works are said to have included streaks of blue ultra violet light that the lens of a normal eye can usually perceive.